This past Saturday was National Trails Day, and regardless of the fact, we had already been planning to hike earlier in the week. You see last week Robin finally received her Vasque Taku GTX hiking boots and Goodhew hiking socks as a result of winning a "Gear Review Opportunity" from the OBN. So just like a kid at Christmas or a kid who receives a new pair of Nikes, she was ready to take them out on the trail. We actually made it to bed early (11:30pm EDT) by our standards so that we could get up early in order to avoid the heat of the day and the crowds in the Smokies. We were so excited about our hike that it was hard for us to either get to sleep or stay asleep. We were both up, ready, and out of the house before 6:00am and on our way to the Great Smoky Mountains. Of course we had to make a couple pit stops for petrol, breakfast, ice, and well, nature calls more frequently when there's something pressing against your bladder almost non-stop. We made it to the trailhead around 8:00am. We donned our gear and headed up the trail. 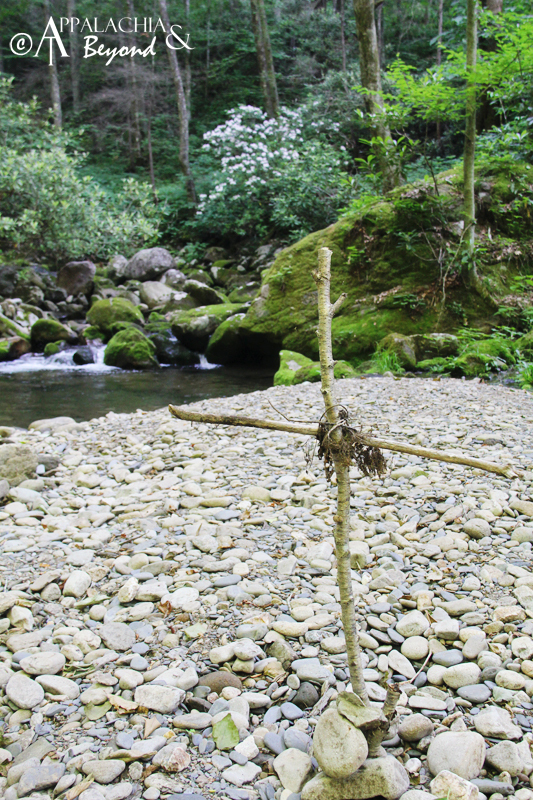 There was hardly a soul in sight, other than three fellers filling their water bottles and bladders at the trailhead. 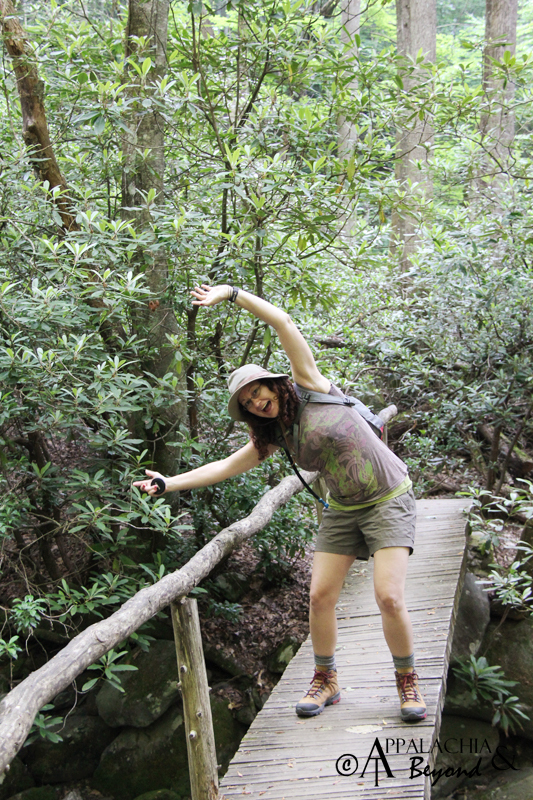 We crossed the footbridge at the trailhead after a few pictures, and started our ascent up the Kephart Prong Trail. The trail is 2 miles in length to the Kephart Shelter and meanders its way up the base of Richland Mountain with an elevation gain of approximately 800-900+ feet. The footing on the trail starts nice and easy as the trail looks to have been an old road bed that serviced the old CCC camp that used to exist in the area. 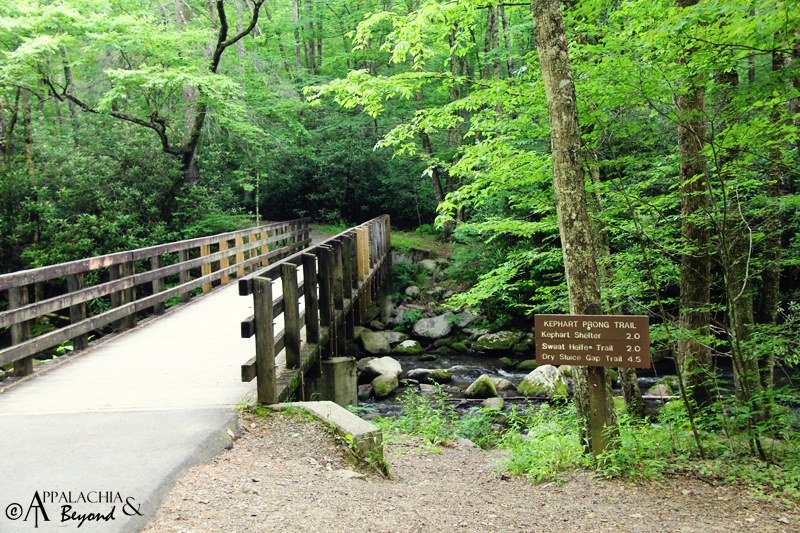 After passing the second footbridge on the trail, the footing starts getting a little more technical which is typical fashion in the Smokies. We reached the quarter mile point and came upon the remnants of the old CCC camp that existed here back between the 1930's and 1940's. During WWII, conscientious objectors were employed in the CCC camp to serve their country as they would not join the army due to their beliefs of non-violence. To the left of the trail is an old stone wall with an entryway that could have possibly lead to living quarters of the CCC camp. Now it just leads down to the river. Just ahead on the right is an old stone sign board for the camp. A side trail is available to walk around the other remaining remnants of the camp. 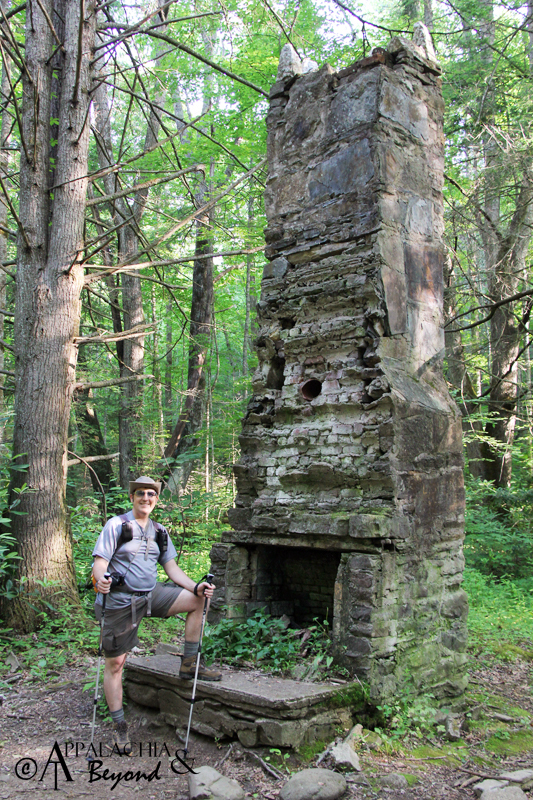 We took this side trail which is about a one to two tenths of a mile at most and discovered an old water fountain and cistern, an old bear trap (which always freaks Robin out), a steel drum, and the chimney stack of the old barracks of the camp. 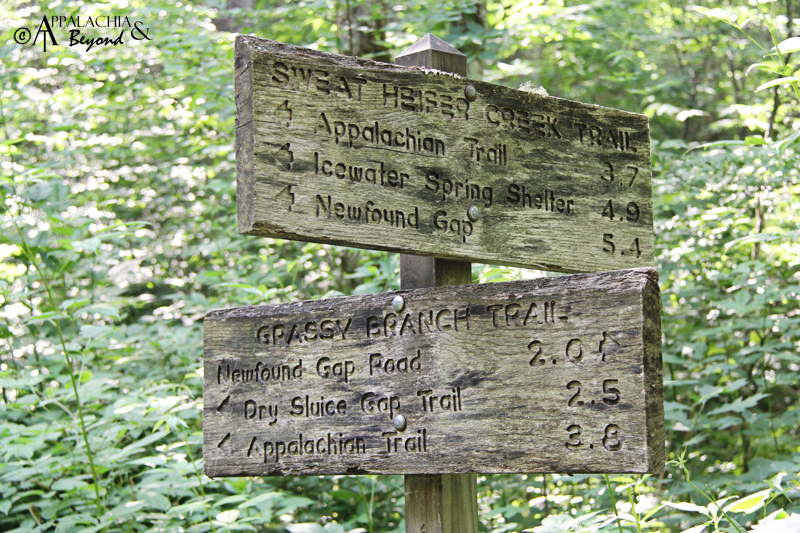 After walking around the camp and thinking about what it must have been like to work in the Smokies back then, we continued up the trail. Just past the old camp is the second footbridge and the first to cross the Kephart Prong. We dubbed this bridge "The Alice Bridge" as it is a bit slanted providing a fun house effect. The scenery along the trail is absolutely breathtaking. 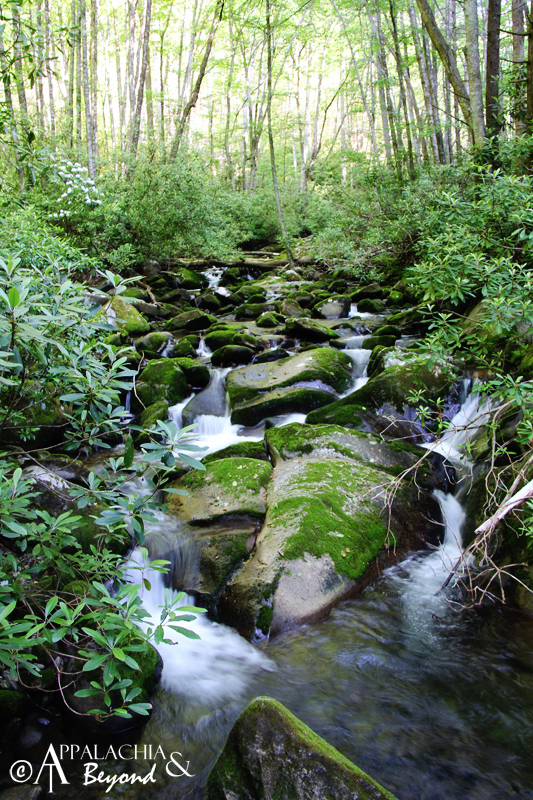 It's primarily a hardwood forest with quite the mixture of trees, rhododendron, mountain laurel, and many different wildflowers such as Bee Balm, Trillium, and many more. Being that it was National Trails Day, I brought along a couple grocery bags to pick up trash as we hiked the trail. It appears that the trail doesn't get a whole lot of traffic as we only crossed paths with about dozen other hikers and "visitors" the whole time we were out. In total, there were about 4 backpackers, not counting the 3 we saw at the trailhead and continued up the road to another trail, 1 serious hiker (who caught us by surprise as he sped passed us heading back down the trail), one family hiking the trail, a couple of fly fisherman, and one couple enjoying a small walk in the woods. I did find a few of pieces of garbage which instead of using the grocery bags, I just stuffed in one of my pockets and discarded in the trash bin at the trailhead. After about two hours of hiking uphill and enjoying the woods, the creek, and various birds singing among the trees, we finally reached our destination, Kephart Shelter. 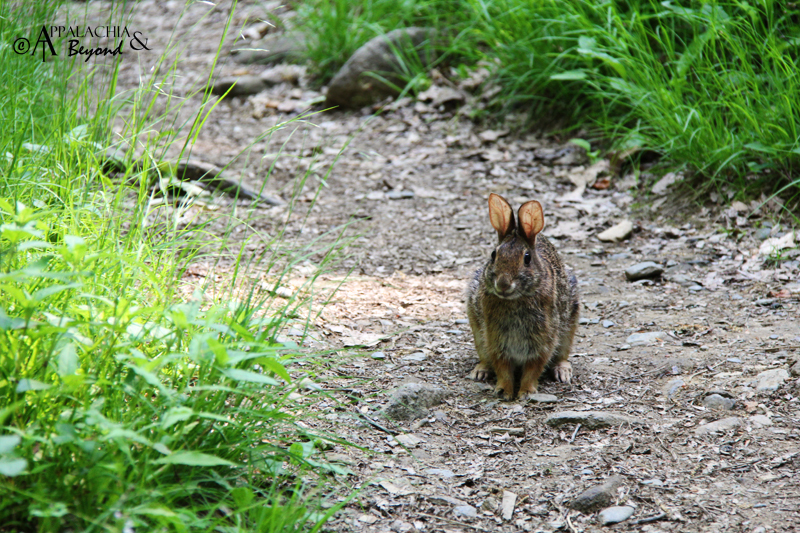 As we approached the shelter, there was a bunny in the trail, which at first I thought was just a tree stump. It was amazing that it allowed Robin to get up pretty close and snap a few photos before it tried to lead us down the rabbit hole to Wonderland, as I'm sure "it was late for a very important date". It seemed as though it posing just for Robin. Rather than follow the rabbit to its hole, we opted instead to find a spot to have lunch as Robin and baby were hungry. At the shelter there were 3 backpackers. 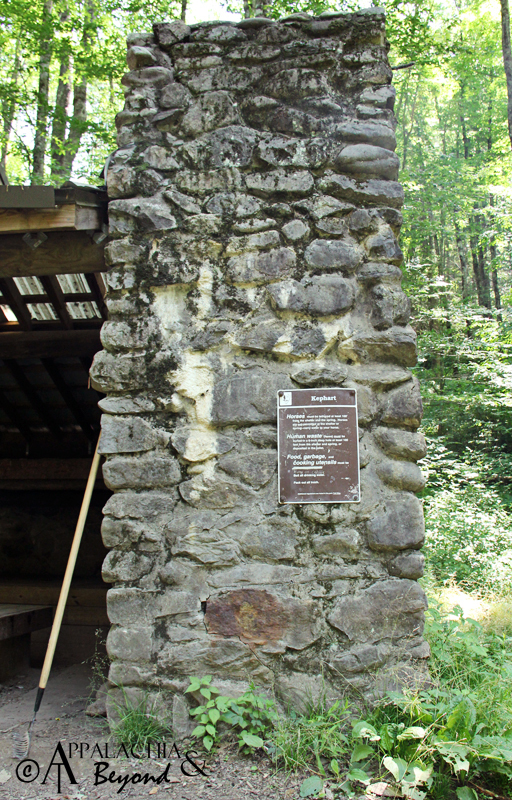 One appeared to be hiking the AT and must have diverted from the trail to stay at Kephart rather than at the Icewater Springs shelter. He was gearing up to head back to the trail as we arrived and really didn't say much. There were two other backpackers that we later found out from talking to them, had driven 600 miles from Michigan to backpack in the Smokies for the weekend. They had their youth so I can see how that is possible for them. After a 12+ hour drive like that, I don't think I could backpack for a weekend. I'd need at least a day or two to recover from the drive before attempting any hiking much less backpacking. Seeing how the shelter was occupied we walked past it about 20 yards and found a nice spot at a footbridge that takes you onto the Sweat Heifer Creek Trail. 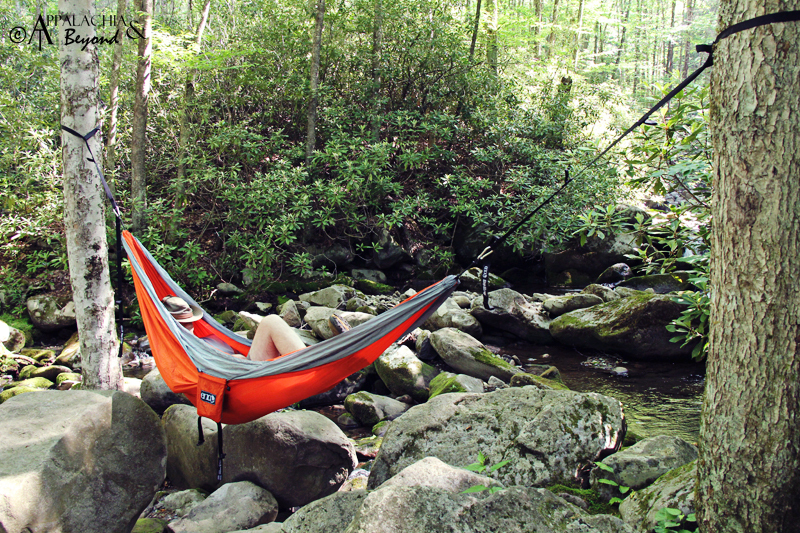 Right at the bridge was the perfect place to hang our ENO Doublenest hammock , so we could relax creek side while enjoying a small lunch on the trail. For lunch we brought with us two Turkey and Cheese Sandwich Lunchable kits complete with applesauce, Nilla wafers, and a small bottle of water with a Kool-aid drink mix. It was quite an enjoyable lunch and very relaxing laying in the hammock next to the creek. We couldn't have asked for a better spot. Once we were finished with our lunch and relaxing in the hammock, it was time to head back down the trail. We stopped at the shelter long enough to exchange pleasantries with the two backpackers and snap a couple of shots. Unfortunately they didn't quite pick up on the hint that we wanted to get some pictures of the shelter and never exited the shelter for Robin to get full pics but that's okay, no biggie. We took our time heading back down the trail enjoying what time we had left as we knew the journey would be over before long. 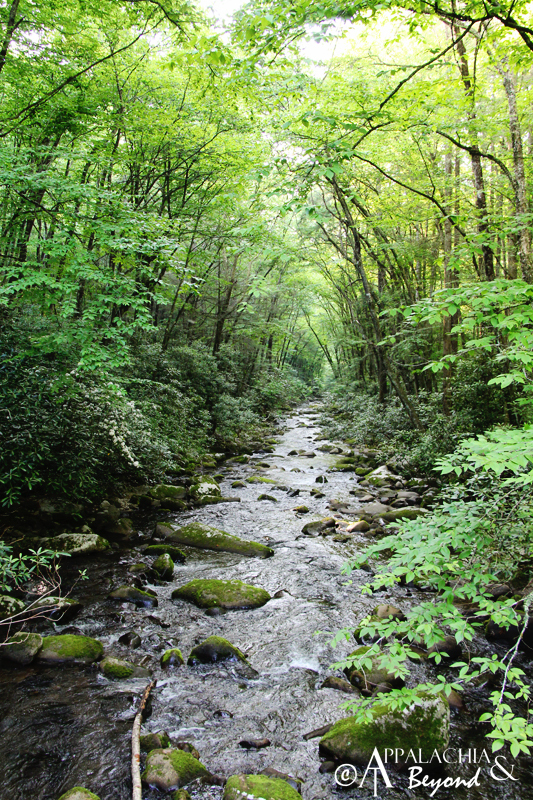 We stopped here and there to take in the mystical scenery of the forest we walked in resplendent with old trees, dense vegetation, a thick canopy and Kephart Prong meandering it's way down to the Oconaluftee river. 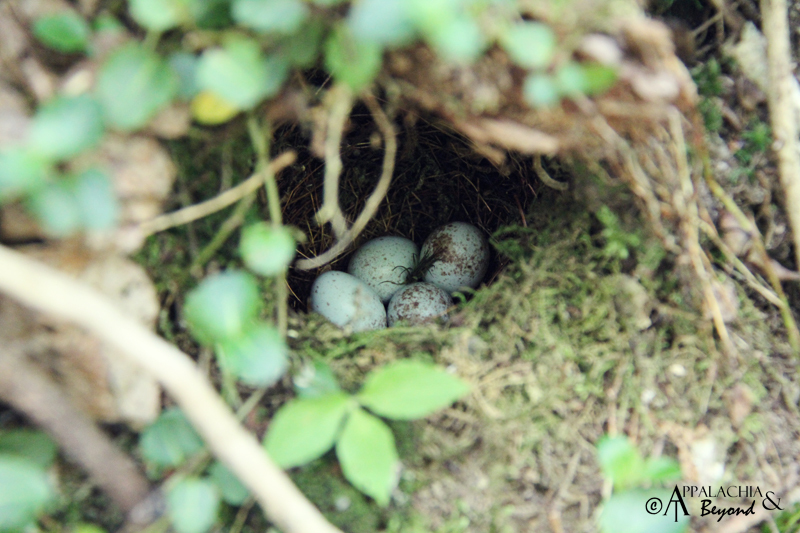 We startled a Dark-Eyed Junco from it's nest at one point and found that it was guarding it's eggs. Further down the trail we took notice of how the butterflies seemed to have filled the trail, flitting to and from from flower to flower, and also how the gnats appears to be much worse than on the way up. I guess the heat of the day got them active enough to dive bomb our face constantly on the way down. You'd think we caught wind of a skunk the way we were swatting/fanning our hand in front of our faces the rest of the way down.